Safe management of compressed gas cylinders should protect the integrity of the cylinder valve at all times and prevent the release of hazardous energy and chemicals. Most all breweries house compressed gas cylinders, often in the form of CO2 cylinders, O2 cylinders, bulk CO2 vessels, air compressors, propane tanks, and even pressurized empty kegs. 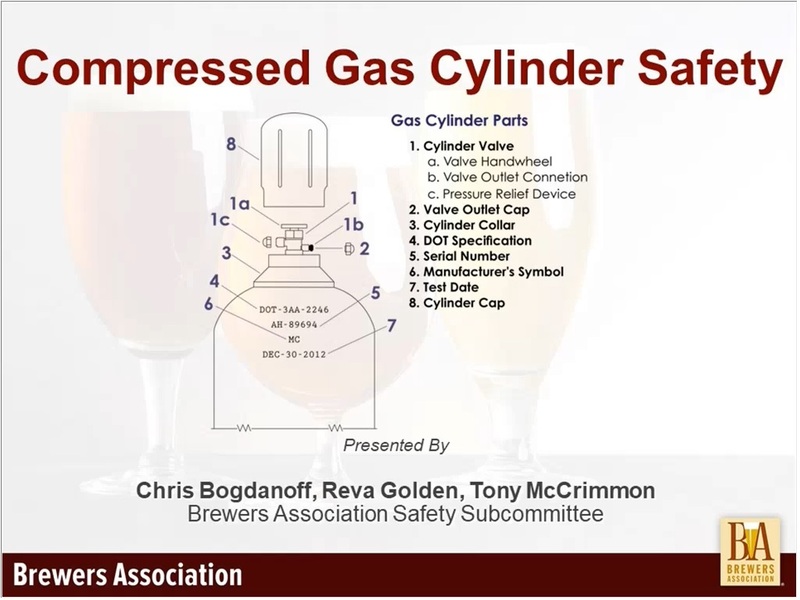 Brewers Association Safety subcommittee members outlined necessary steps to ensure the safe handling, storage, and use of compressed gas cylinders in the brewery environment. They recommend performing a hazard analysis for each vessel type. This requires understanding of chemical compatibility, chemical attributes, potential energy release due to pressurization, and prevention of creating a hazardous atmosphere. Proper storage, use, and handling of compressed gas cylinders can be easily achieved, but does require a proactive plan to ensure the safety of brewery employees. Compressed gas cylinder safety falls into three categories: Storage, Use, and Transport/Handling. Compressed gas cylinders must be stored in a secure and upright position. Compressed gases are chemicals too—separate non-compatible chemicals!